While raising a family, Diana took a hiatus for awhile from entertaining, working in sales and marketing, as assistant to a magician, and nursing, until eventually she followed her dream and moved to Branson nearly 15 years ago. Diana has regularly performed as the lead female vocalist in A Neil Diamond Tribute Show and co-starred in the hit production Duets with her husband, Keith Allynn, a look- and sound-alike of Neil Diamond. 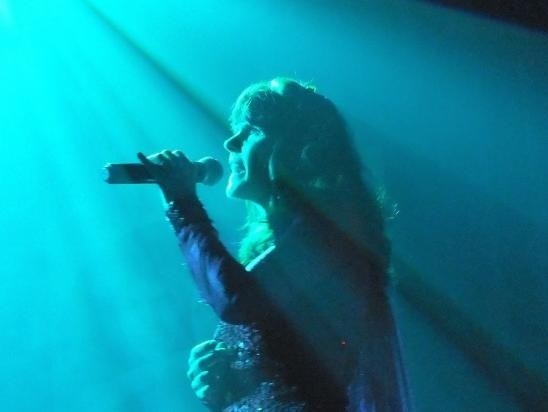 Diana now stars in her own show, Carpenters Once More, an award-winning live Branson production. Diana’s partner of the show, actor and musician Ron Preston has appeared on stage, television, motion pictures and radio. He has performed in some legendary rock venues. Ron has appeared also with luminaries such as Charles Bronson and Chuck Norris. He has performed also stunts and scored in some films including musical acts as diverse as Peter Tork of the Monkees and Brian Setzer with his Orchestra and with the Stray Cats. Diana Lynn who has the voice of Karen Carpenter will put you to the edge of your seat as she performs the hit songs of the fantastic duo. As Karen Carpenter and Richard Carpenter, Diana and Ron pay homage to the famous duo from top to bottom. Thanks to Lynn’s hauntingly beautiful voice and perfectly sung songs of The Carpenters. The Carpenters’ lives and Richard Carpenter’s present life are interspersed with fascinating musical accompaniment by Ron Preston, not to mention Lynn’s several clever costume changes. Diana Lynn is sure to captivate audience with her similar voice of Karen Carpenter and new twist on the old classics. The tribute show highlights the hit songs of The Carpenters with an unforgettable and heartwarming style of music. An amazing singer with beautiful voice, Karen Carpenter gave us melodious, easy-on-the-ears music that scored big in a time when disco and rock-pop reigned supreme. “Carpenters Once More” presents a wide array of sensational hit songs from their early years through to their last songs. Beautifully delivered by two veteran Branson entertainers, Carpenters Once More is one of those rare shows in Branson that make your musical experience extra special. So, if you want to hear the greatest songs of The Carpenters, visit the historic Owen Theater in Branson where Diana Lynn and Ron Preston perform tribute show for the famous duo.